Looking for online stores that sell great loose leaf tea? Not sure what tea brand to choose? You’re in the right place! At MadTeaClub, we don’t sell or produce tea. Instead, we share secrets to finding the best loose leaf teas and quality teabags on the market. We’ve searched through hundreds of tea brands online and thousands of products, and handpicked just a few to showcase them under one roof. 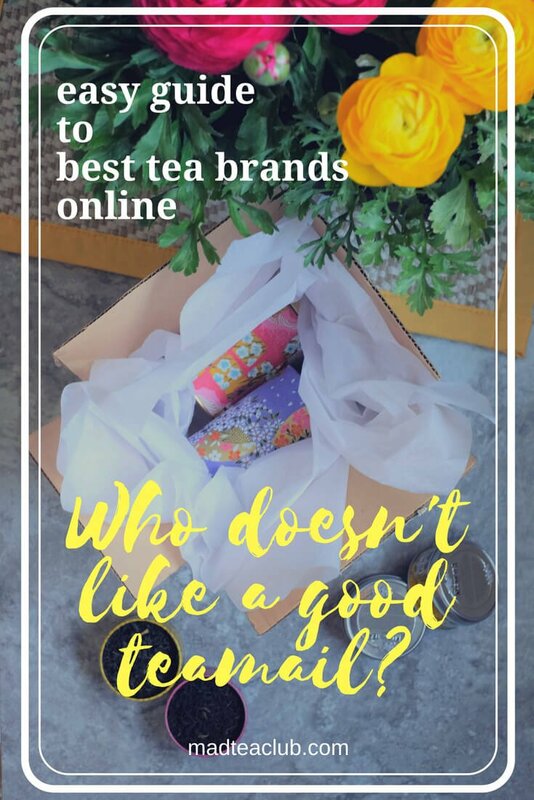 Why buy tea online? What’s wrong with the grocery store? The tea industry has a problem. The most common brands such as Lipton and Bigelow that you can find at your office pantry or on a supermarket shelf are really at the bottom of the quality spectrum. They’ve probably done a lot of damage to the reputation of tea in the eyes of the casual consumer. There are slightly better choices of tea at premium supermarkets, but even these stores have a pretty limited range of tea types, mostly from larger brands. Local tea shops may be a great alternative, but they are rare, at least in this part of the world where Starbucks coffee is a drink of choice. In comparison, the huge variety of teas available online will leave you amazed. This abundance of choice may be overwhelming, but hopefully MadTeaClub can help you find your bearings! So, what are the best tea brands online? It depends on what you like. There’s no single best online tea store or tea brand that is the optimal choice for every tea lover. Some tea shops focus on specific tea varieties, while others focus on select regions. Some of our favorite tea brands are well-established tea companies who sell quality loose leaf teas at bargain prices. Others are relatively small businesses who export directly from tea plantations and create artisan tea blends. Do not use tea brand recognition as your only guide. Larger brands may play it safe and limit their portfolios to basic choices so they can market to more consumers. In contrast, smaller tea companies are typically more enthusiastic and passionate about their business. New tea brands often create unique artisan tea blends, smart teaware, and inventive packaging. Many online merchants specialize in bringing rare loose leaf teas to the market in limited quantities. These products wouldn’t fit large tea brands due to their lack of scale and limited supply. How online tea stores bring value to you and the farmers. The best tea brands have personal connections with tea growing communities. They export directly from the producers as opposed to wholesale importers. Tea drinkers get their garden fresh loose leaf tea in a matter of just a few weeks. This economically straightforward business model eliminates the middleman. As such, the value goes only to the two key parties – the consumer and the tea grower. Moreover, since harvesting, processing, and packaging in one place leaves more money within the tea growing community, this business model also supports better social programs such as schools for kids and healthcare for families. For starters, pick a type of tea that you like. Do you have a favorite tea flavor? Do you prefer teas from China, India, or Japan? Go beyond the most popular tea types. “English breakfast”, “Earl Grey” or “green tea” could be your starting point, but there’s so much more in the tea wonderland! Don’t be shy to explore it. If you browse our Japanese green tea section, for instance, you could end up with exciting new finds and learn to appreciate the nuanced differences between “Sencha” and “Guyokoro”. Similarly, the Bergamot-infused tea blend known as “Earl Grey” may be one of the most recognized tea products out there, but you could also discover a new personal favorite in “Green Earl Grey” or “Cream Earl Grey”. Use the website navigation or our tea menu>> to find your favorite tea type or flavor, and discover the best-loved products from the most awesome tea stores across the internet. We’ve handpicked the best loose leaf teas of all styles and placed them in logically organized niches. Browse the tea menu, read interesting tea facts, and use our Top 10 list for recommendations from the most reputable tea stores online. Full array of classic and flavored teas including luxury collection of finest teas in the world, assortment of Chinese and Formosa oolong teas. Black, green, white, oolong, rooibos, herbal, decaf, and iced teas. Loose tea, sachets, sampler sets, gift boxes. Plus, create your own blend and share it with the world! Wide selection of classic teas and signature blends in array of flavors, including many single origin Chinese and Indian teas. Black, green, white, oolong, rooibos, herbal, decaf, and flowering teas. Loose leaf tea, sachets, tins, samples, gift sets. Kosher, Organic, Fair Trade certified. All tea blends crafted on premises. Customized tea blends offered as a part of Private Label program. Wholesome teas created with the idea to help you balance your physical, spiritual, emotional state. Extensive diverse selection of hundreds of flavors and botanical ingredients. From classic black and green teas and herbal favorites like chamomile and mint tea to rare and hard to find botanicals, Buddha Tea presents the whole world of tea. Black, green, herbal, decaf tea blends. One of the largest collections of rare botanical ingredients. Discriminately selected collection of very special, wholesome black, green, white, oolong, and herbal teas and botanical infused blends. All organic teas. Golden Moon pledge to deliver only the purest, 100% natural teas with no artificial additives whatsoever. Green, black, white, oolong, rooibos and herbal teas. Estate teas (Darjeeling), fine tea blends. Many bergamot-based flavors – it’s a wonderland for an Earl Grey lover! All tea types and tea blends. Loose leaf tea and tea pouches. Each biodegradable pouch is hand-stitched with unbleached cotton. The tea pouches filled with high quality loose leaf tea leaves, herbs, fruits and spices from around the world. All kinds of China teas, including green, black, oolong, white, pu-erh, and herbal. Many organic varieties. Teavivre pledge that all their teas meet the European low pesticide residues standard. Teavivre ships their fresh and authentic Chinese teas directly from China. Have no fear – they offer free shipping on orders over $30. Full array of pure and flavored teas, including single origin Indian and Chinese teas, good selection of Japanese green teas. Black, green, white, oolong, rooibos, herbal, decaf, and iced teas. Loose tea, tins, sachets, samples, gift boxes, bulk. Plus, innovative teaware designed by the founder. One of the largest collections of single estate teas and signature blends from India and Nepal. Black, green, oolong, white teas. Loose leaf, samples, bulk and wholesale. All teas processed, packed and shipped directly from the source. Garden fresh tea delivered from the estate to your cup in less then a week. Vahdam strives to ship your orders as soon as possible with your chosen delivery option. All orders are generally dispatched within 24-48 hours of being placed.